"I just wanted to thank both yourself and Izzy for all your hard work yesterday, all the children had a wonderful time and all the parents were so impressed with the way you ran the party. I'll definitely be recommending you to anyone who is looking for an entertainer." 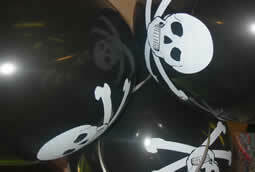 "We would like to express our thanks for taking the stress out of our party and being very organised with the children. They all looked like they were thoroughly enjoying themselves. The parents also expressed how impressed they were with the whole party and the activties you did for us on the day. I shall definitely be using your party organisation skills again"
"A big thank you for the party. You showed a lot of energy, enthusiasm and flexibility which was great. Our children loved it and all of the oher parents we spoke to loved it too." "You were both really friendly and approachable, you achieved exactly the party we wanted, all the activities were appropriate to the ages and we would recommend Activity Parties to others"